Valerie Hopkins joins JFS in the role of the RSVP Coordinator working with volunteers 55+ who are giving their time to improve the lives of individuals at JFS as well as volunteer stations throughout the area. In this role, she coordinates volunteer activities, tracks hours, communicates between stations. Valerie also is responsible for recruiting and retaining volunteers to ensure all community needs are met. Currently, Valerie works with JFS RSVP stations including Gilda’s Club South Jersey, Family Promise Atlantic City and Reading Buddies at Our Lady Star of the Sea. Volunteer activities under her responsibilities include meal/grocery delivery, trash valet, homeless support, reading to children, cancer support and special event assistance.Prior to joining JFS, Valerie worked for the Alzheimer's Association in Atlantic County where she taught families how to cope with Dementia. 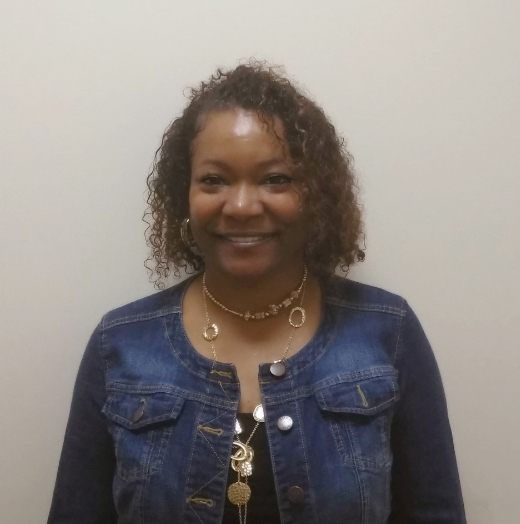 She leads by example for agency volunteers, as Valerie actively gives her time for the Atlantic County Public Health Department as a MRC volunteer and Eastern Service Workers in Pleasantville. She also volunteers with CASA where she helps with special events. She is the founder of Ladies in Prayer Succeed, an organization that empowers young women and girls to collaborate their gifts and talents to the community. She attended Thomas Edison State College in Trenton NJ. Valerie also holds a New Jersey State Cosmetology license. She is an active member and volunteer for the youth at Mt Zion Baptist Church in Pleasantville, where she teaches Sunday school to children 4 years old to 6 years old. In her spare time, her hobbies are hair styling, sewing, arts and crafts, bowling.